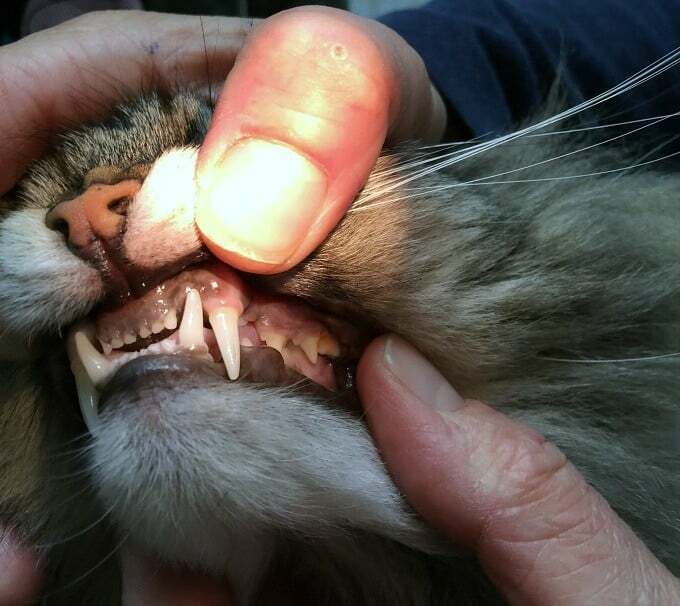 At the beginning of February, my cat, Misty, started on her journey to oral health. She visited a local veterinarian to have her teeth cleaned and then started eating a new food, Royal Canin Dental Nutrition Formula. I said in that post that I’d update you in May with her progress so that’s what I’m here to do today! The experience has been great. Misty transitioned perfectly to the new cat food. Actually, all the cats have been eating it, but Misty was the only we were tracking for this campaign. The food bowls are empty at the end of the day. Everyone is using the facilities as per the norm. All is good in kitty world. The Royal Canin Dental Nutrition Formula offers complete and balanced nutrition from “Tooth to Tail”. The kibble design and the ingredients provide triple action dental care that’s been clinically proven to reduce plaque and tartar and help prevent gingivitis and halitosis. My vet asked if I could hear any crunching when Misty was eating. I told her that there was lots of crunching going on. That’s a good thing. It means she is eating it and the kibbles are doing their job. Another key benefit that the vet mentioned to me was the S/O Index and how it supports urinary health. This means that this diet helps to manage urinary pH, urine volume and mineral concentrations to prevent struvite and calcium oxalate crystals and stones from forming. The vet asked about Misty’s stools and I told her that everything is fine in that department. I know because I’m the only one changing the litter boxes and everything looks as it should be! The Royal Canin Dental Nutrition formula contains highly digestible proteins, prebiotics and zeolite for digestive support and protection of the gastrointestinal tract. Earlier this week, I took Misty in for her check-up with the vet so she could evaluate her progress and see how her teeth were looking. 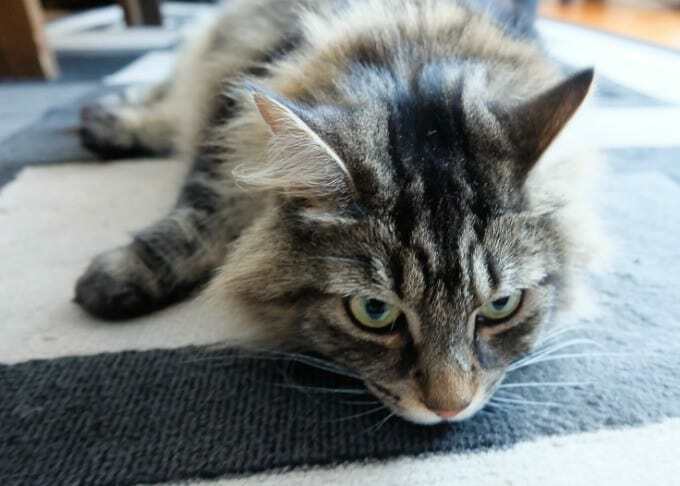 Misty had stage one periodontal disease back in February. My first post details more on what periodontal disease is and how it can be prevented. I’m happy to report that Misty is back on track with her teeth. 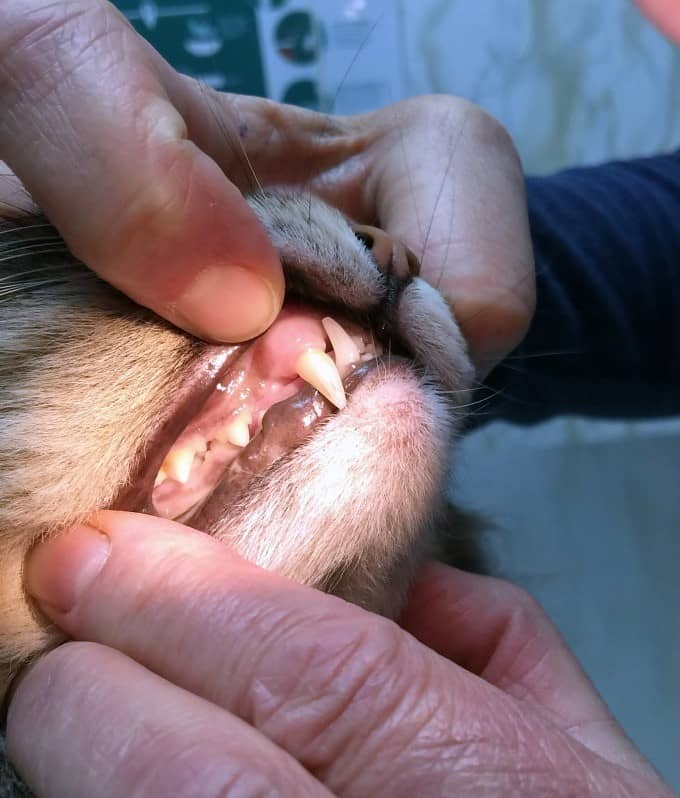 The vet said they were looking good especially the back teeth where she does most of her chewing. She was pleased with her progress and recommended I keep going with the dental food. I asked her about brushing Misty’s teeth because it was a struggle. Misty fought me and I have the scratches to prove it. The vet told me she doesn’t even think she has five cat patients who let their parents brush their teeth. She told me to not feel bad about it that some cats just don’t like it and refuse to have it done. Taking these teeth photos to show you was a four person job! Misty can be quiet, but she will let you know if there is something she doesn’t like doing. Misty’s teeth and gums are healthy and looking a million times better than her visit in February. 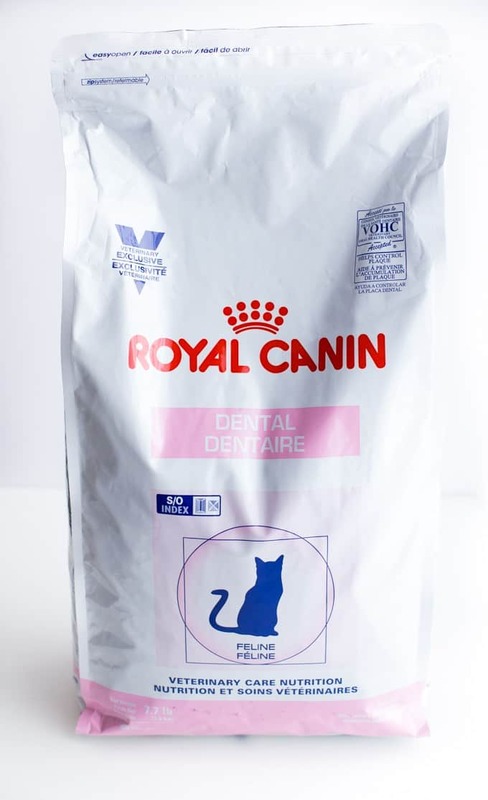 Royal Canin Dental Nutrition Formula can be purchased at your local vet’s office and comes in 340 g, 1.5 kg, 3.5 kg and 8 kg bags. I’ve been getting the 3.5 kg bags for my cats and it lasts about a month. It’s also available for dogs so make sure to ask your vet about it next time you go! We are keeping the status quo and will continue to feed Misty and her brother and sister the Royal Canin Dental Nutrition Formula. They enjoy eating it and the vet said to continue on with it because it’s working for them. I feel better knowing that it’s helping their teeth and giving them the nutritional support they need. They all come running when they hear me putting the food in their dishes. I’d say that’s a sign that they agree too! 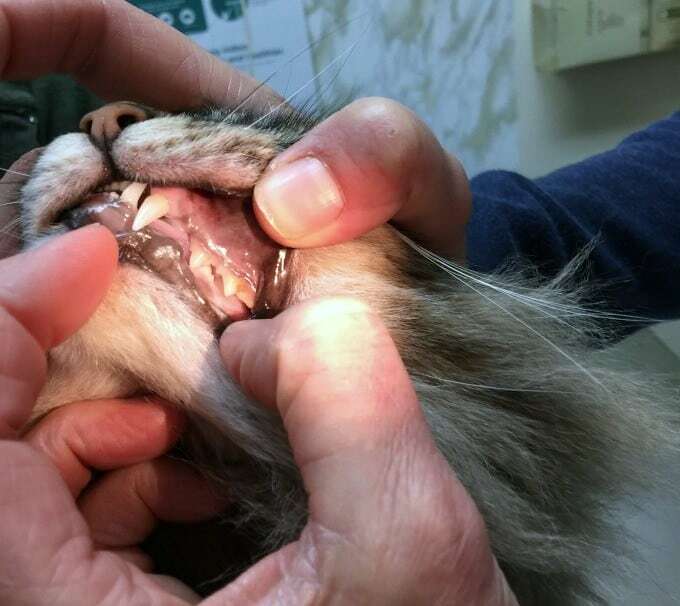 Do you have any concerns about your pet’s oral health? Connect with Royal Canin on Twitter and Facebook. Disclosure: I was compensated as part of the 2016 Royal Canin Dental PR Campaign. All opinions and experiences are my own. Her teethe look nice now, we brush our dogs teeth once a week and give him Dentabone and it works great too! I am so glad that your kitty is on the mend!